Indian economy is gradually becoming more industrialized but still, it remains greatly dependent on the agrarian sector. The starkly naked image of this dependency reveals its ugly face in years of below-normal monsoon when food prices skyrocket. This is when India feels the need of addressing issues of the agricultural sector. Unfortunately, such concerns remained shelved for years with little attention being diverted to aid the ailing agrarian sector. Such negligence manifested in form of 5.3% drop in foodgrain production during the fiscal year 2014-2015. Prior to that, both economists and farmers were on their toes because of the nature’s aberration named El Nino phenomenon. News of farmers committing suicide because of crop failure caused by inadequate irrigation facilities and lack of rainfall were rampant. Indian economy entered an inflationary phase because of low agricultural production and the environment had become seriously scary due to caching of foodgrains by black marketers in order to push up the prices for monetary gains. This time however new hopes are floating around with the announcement of the Pradhan Mantri Krishi Sinchai Yojana (PMKSY). PM Narendra Modi chaired the CCEA (Cabinet Committee on Economic Affairs) meeting and chalked down the final details for PMKSY. As revealed by Arun Jaitley, the current finance minister of India, the Central Government aims for spending ₹ 50,000 crores under the Krishi Sinchai Yojana. Jaitley revealed that the amount finalized for the scheme will be spent by Center but the State Governments are also readying themselves to pitch in with additional funds, which according to Jaitley, will be above the Center’s budget. Jaitley confirmed that the entire pool of money from the Center will be spent over a period of 5 years with ₹ 5,300 crores being allocated for the current fiscal year. The finance minister was quite enthusiastic to point out that the budget set for the current year is twice the budget ever set in any previous budget for any type of agricultural reforms scheme. According to him, the whole money will be invested in various activities that will help to increase productivity and farm yields. With such massive budget in place, economists believe that if the scheme is implemented properly as intended, Indian agrarian sector will experience a booming growth with foodgrain productions increasing manifolds. If this really happens, Modi government will manage to put a ceiling on inflation rates. Growth in agricultural productivity will have snowball effect on other industries that heavily depend on agriculture for raw materials. Only time can tell whether this ambitious project will come to fruition or not. What is proposed under Pradhan Mantri Krishi Sinchai Yojana? India has a total of 142 million hectares or cultivable land. Unfortunately, artificial irrigation serves only 45% of this total agricultural land. The remaining 55% depends solely on nature’s mood! Delayed rainfall or low rainfall – both play havoc on farmers of the remaining 55% land. Either of the two natural conditions can mean a catastrophic crop failure that engulfs the whole economy, not to mention, the farmers are the worst hit elements. Provide artificial irrigation facility to 6 lakh hectares of arable land. Provide drip irrigation to 5 lakh hectares of arable land. With those two targets in mind, the PMKSY will place focus on end-to-end irrigation and micro-irrigation projects. For micro-irrigation, government has come up with the name ‘Har Khet Ko Pani’. Rework on them with strict guidelines of quality control. Complete 1,300 incomplete watershed projects. Investment for irrigation projects to be made directly at field-level. Assured irrigation to encompass greater arable land area. Increase water usage efficiency on farms and hence, minimize wastage of water. Adopt advanced technologies for saving water and precision irrigation. Additionally, ₹ 200 crores will be set apart from the PMKSY for the promotion of NAM or National Agricultural Market. The government has named this corpus as Agri-Tech Infrastructure Fund, abbreviated as ATIF. NAM sounds a promising endeavor because it will open doors to market where farmers will be able to directly sell their agricultural produce at better rates. Finance Ministry also aims towards fusing the budget for PMKSY with MNREGA’s material component which will then be minutely monitored for outcomes. 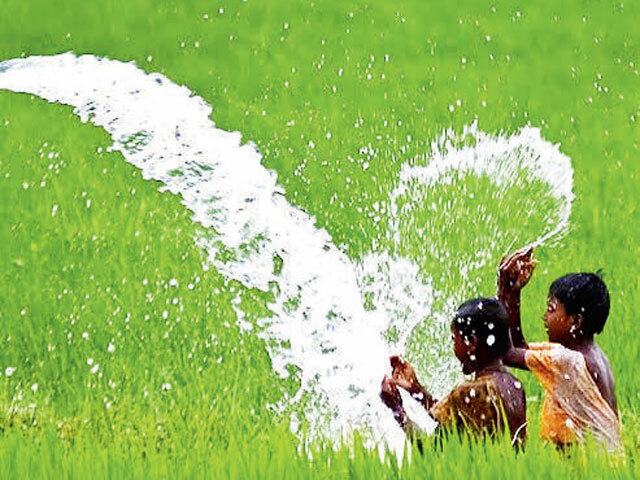 While expanding artificial irrigation to 100% of arable land over years remains the primary target of the Pradhan Mantri Krishi Sinchai Yojana, the government has made it clear that water conservation will also receive proper focus. According to PM Modi, while new irrigation facilities are very important, water resource optimization and sustainable water preservation are also equally important. This has led to the motto of More Crop per Drop under which the scheme aims towards harnessing methods in which municipal water can be treated and reused for irrigation. This makes sense because water is a precious resource and not all water sources can be used for agriculture. This is why, according to Arun Jaitley, water recycling is actually a trump card for the overall success of the Pradhan Mantri Krishi Sinchai Yojana. Sadly, water recycling involves huge expenses and government is fully aware of the fact. It is because of this, the government plans on inviting private investments as financial aid. Who controls the Pradhan Mantri Krishi Sinchai Yojana? The plan comes from the center but the major problem that the government is going to face is the scattered distribution of arable land across the country. As a result, implementation and monitoring the progress of the scheme is difficult. To overcome this problem, government has decided to decentralize the overall planning and implementation of the scheme. State governments have been tasked with the responsibility of coming up with district level irrigation plans (DIP or District Irrigation Plans). DIPs will aim for the integration of water usage application, distribution network and water resources. All DIPs will be prepared at district and block levels. A National Steering Committee with representatives from different ministries will be responsible for supervising the project planning and ensuring that both State Irrigation Plans and District Irrigation Plans are carried out over the long run as per strict quality guidelines. The NSC will be chaired by PM Modi himself. While National Steering Committee will be responsible for overseeing the planning of the project, the implementation aspect will be monitored by National Executive Committee or NEC. NITI Aayog’s Vice Chairman will be chairing the NEC. Apparently, Pradhan Mantri Krishi Sinchai Yojana appears to be a massive standalone undertaking but it is not! It is in fact one of the many pro-farmer measures lined up by NDA government. The Modi-led Cabinet pondered on the prospects of amending the 2013 Land Acquisition Act so that farmers whose lands are acquired by government for different projects can enjoy several benefits. Social security schemes (like insurance and pension schemes) and Paramparagat Krishi Vikas Yojana are some of the many measures taken by the NDA government with specific focus on helping the poor segment of the Indian populace, especially those from the rural parts of the nation. What benefits can be expected in Pradhan Mantri Krishi Sinchai Yojana succeeds? Improved agricultural production will keep prices of food items in check and hence, control inflation. As agricultural produce increases, there will be surplus. A part of this surplus can be exported and this in turn will lead to an influx of foreign capital. Some part of the surplus can be store for use during periods of poor production. Increased agricultural production will also lead to growth of other industries that are dependent on agriculture for raw materials. Also, as agricultural production increases, the need for importing agricultural produce from other countries drops. As a result, the money that was otherwise set apart for import can be put to use in other areas like infrastructure development, repayment of international debt etc. There is not even a single hint of doubt that the Pradhan Mantri Krishi Sinchai Yojana is an ambitious scheme. All the government needs to do is deliver as promised. This is the primary challenge because a project of this scale will have planning and implementation loopholes. There may be situations of money being not properly accounted for. Prevention of such things depend on government’s plan of action and vigilance. Hopefully, NDA government will stand up to its promises. On the May, 2018, PM Modi has announced the launch of a new scheme that will fund micro irrigation. The scheme is officially named Pradhan Mantri Krishi Sinchayee Yojana, and the Micro Irrigation Fund scheme will be implemented by Ministry of Finance. It will be implemented in all parts of the nation simultaneously, and will require an estimated 5000 crore. The framework on this project will be created by NABARD. During 2018 – 2019, central government will spend around 2000 crore, and in the next financial year, the scheme will cost another 3000 crore. The authority will have 7 years, with an additional 2 years to pay the sum back. Under this scheme, Per Drop More Crop Component will be streamlined and more utilization of land will be made possible. The goal of the government is bring 2 million hectares of land under this scheme on an annual basis. State governments will be encouraged and offer incentives to implement micro irrigation projects in their areas. India has the potential of bringing 69.5 million hectares under schemes like this. As of now, only 10 million is actually placed under this project. The central government has decided to bring maximum amount of land under micro irrigation, within coming 5 years. These schemes can become milestone in the field of agriculture, if implemented properly and fully.